CIRCA’s current projects in the area of policy and planning are listed on the Policy & Planning Projects & Products site. There you can find a description of ongoing projects and any products from the project, including tools, reports, data, presentations, etc. Below is a general description of policy and planning needs. In order to support community climate adaptation planning and policy through research and analysis, CIRCA seeks to better understand the challenges facing the state and its communities. The Institute examines various methodologies to understand better how towns can manage diverse policy goals, funding challenges, alternative approaches to adaptation, and implementation problems in pursuit of effective climate adaptation. In the aftermath of storms and as the climate changes, communities are faced with decisions about how to build back and plan for the future. There are both regulatory mandates that they must face, i.e. floodplain building regulations, planning and zoning ordinances, flood insurance, and coastal zone management as well as voluntary planning activities, such as coastal resilience plans. Once a community identifies potential actions, options for paying for these actions must also be identified and balanced against other pressing needs of the community. The federal government has embraced resilience as part of its recovery programs to aid communities in their efforts to “build back better” as noted in the Hurricane Sandy Rebuilding Strategy. The strategy includes using innovative design and green infrastructure approaches. With the federal government’s commitment to resilience planning also came funds for those planning efforts through recovery grants such as FEMA Hazard Mitigation Planning and the HUD Community Development Block Grant Disaster Recovery program. Across the state, Connecticut’s municipalities are using these funds to plan for the future and adapt their infrastructure. 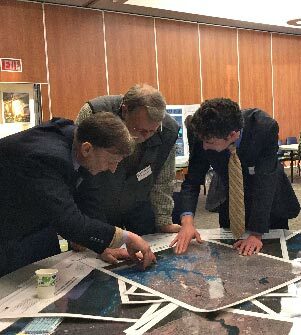 CIRCA’s work in this area includes the development of decision support tools that can be used by communities to better incorporate future projections of sea level rise and flooding into their plans and infrastructure decisions. CIRCA engages in policy analysis and the development of model policy options for municipalities such as planning and zoning ordinances and financing tools. The Institute has partnered with the State on multiple governance and planning efforts. CIRCA is a member of the Long-Term Recovery Committee, State Agencies Fostering Resilience, and the Governor’s Council on Climate Change. CIRCA staff led the development of the State’s application for the HUD National Disaster Resilience Competition, including providing a regional vulnerability assessment and resilience concept. U.S. Department of Housing and Urban Development. “Hurricane Sandy Rebuilding Strategy: Stronger Communities, A Resilient Region.” Hurricane Sandy Rebuilding Task Force. Washington, DC 2013.